Maundy Thursday is a day heavy with meaning and mystery. But on this Maundy Thursday, we consider the most meaningful and mysterious thing about this day. I want to talk with you about the is-ness of this day. Tonight, you see, we do more than remember Christ, His death, and His resurrection. He will be with us. He will relive the crucifixion and resurrection in us. And He will welcome us to the heavenly banquet He eternally shares with all who believe in Him. The gospel writer Mark tells us about this meaningful and mysterious meal you and I are about to have once again. First, some background. The Old Testament shows us that the central saving event of Israel’s history was God’s deliverance of His people, Israel, the Hebrews, from their slavery in Egypt. This event was not just celebrated by the Jews. It was reiterated, re-lived, re-experienced in the Passover festival each year. In the Passover, Jews don’t just go back to the events the day celebrates, they participate in the first Passover all over again. There is a present-tense is-ness in the Passover. Above all, as you know, Passover is annually re-lived in the Seder meal. It was while commemorating the Passover meal with the twelve apostles that Jesus chose to institute the most meaningful and mysterious meal there is, the most meaningful and mysterious thing about Maundy Thursday. In this meal, which Jesus first shared with the twelve on the night before He would be crucified, four days before God the Father would raise Him from the dead, Jesus anticipates and gives us the means to regularly relive the central saving event not just of Israel’s history, but of world history. That central event, of course, is Jesus’ death and resurrection. In this meal, Jesus makes us not spectators of what He does for the sinners of the world. He doesn’t hand us a souvenir of His death and resurrection. In Holy Communion, Jesus makes us part of what He has done and is doing. He gives us the forgiveness of sins He bled to buy for us on the cross. He gives us the new life that He gains when, as the perfect sinless lamb of God Who takes away the sin of the world, the Father raises Jesus from the dead. Receiving Holy Communion for believers is a bit like this: While we’re watching a favorite movie, a character in the film turns to us and invites us to become part of the story, to come up onto the screen and to have a full share in the pains and the joys that they’re experiencing, to partake of their happy ending. As we trust the words Jesus spoke on Maundy Thursday over the bread and wine, we receive His body and blood and become part of His story. We go through the cross. We rise from the tomb. We reign with Jesus in the heavenlies. The new life that only Jesus can give is taken into our very bodies. Jesus asks us to take Him, the crucified and risen One, into ourselves, so that we become one with Him. I can’t explain how this works. 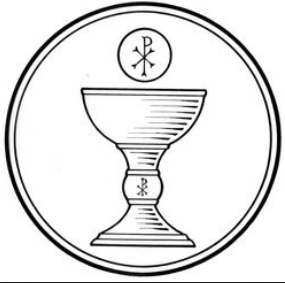 The sacrament of Holy Communion is a mystery. I only have Jesus’ word for it that when His words of institution--”This is my body”--meet the bread, the bread becomes not just bread, but also Jesus’ body. The same is true when He says in verse 24: “This is my blood of the covenant, which is poured out for many.” The wine is more than just wine; it’s also Christ’s blood. But why? Why does Jesus want us to take His life into ours? Let me suggest one of several partial, imperfect, human explanations: The ancient Jewish rabbis in the intertestamental period picked up on the prophecy of Isaiah and Ezekiel that once the Messiah had completed His work in the world, He would invite the faithful to a great banquet. Conquered and eaten leviathan represented the final conquest of God over evil. Jesus subtly alludes to these teachings when, after His resurrection, He invites the apostles to enjoy the broiled fish (what my mentor, the New Testament scholar Bruce Schein called “miniature leviathans”) He had prepared for them. When we receive Jesus’ body and blood then, we not only ingest His life, we also physically receive a share in His conquest of sin and death. Paul says that when Jesus died on the cross “God made him who had no sin to be sin for us, so that in him we might become the righteousness of God” (2 Corinthians 5:21). Jesus, bearing our sins, when lifted up on the cross, became like the bronze serpent Moses lifted on a pole in the wilderness to bring healing to God’s people (Numbers 21:4-9; John 3:14-21). So, in Holy Communion, Christ, as we trust in Him, graciously gives us a share in His conquest of evil. With all that’s happening in Holy Communion, who can blame the apostles for being mystified on that first Maundy Thursday? Nobody can fully understand it. But I have good news for you: We don’t need to fully understand it. We simply have to believe what Christ promises in this sacrament. “This is my body.” “This is my blood.” Jesus gives us His body and His blood whenever we receive the sacrament. Jesus gives us His whole self when we gather at His table. Just as He gave His whole self on the cross on Good Friday. And it is this same whole self that rose again. Listen: Every time we receive the sacrament, we live again Christ’s death and resurrection. We live it with Him. It happens to us and in us again. And we become beneficiaries again of what Christ has done for those who believe His words over the bread and wine, of God’s forgiveness and life with God. Paul writes in Romans 10:9: “If you declare with your mouth, ‘Jesus is Lord,’ and believe in your heart that God raised him from the dead, you will be saved.” Similarly, if we trust Jesus in telling us that the bread is His body and the wine is His blood, we have all that the meal brings. Christ lives in us.